Hello, and thanks for taking the time to look at my camera pan project. I've been fascinated with explosion of time lapse photography that's happened in recent years, and I've wanted to improve the results of my own work. Always on a budget, I don't have the funds to purchase a professional rig. But I've got a few tools and wanted to see what was possible. This page goes through the drive system for my camera pan project, I'll put up the information on the electronic control system for it soon. I'm also accumulating parts to build a linear slider which I can use with this pan unit or on it's own. Once I get that working I'll post it as well. The main camera that I use for time-lapse is a GoPro, because it has an intervelometer built in, and because it has a very wide angle lens which suits my work. For awhile I was using a kitchen timer system to rotate the GoPro. Similar to this. While that sometimes worked, it had drawbacks. 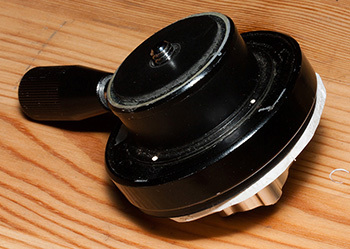 The kitchen timer system only rotates in one direction, and only at one speed. 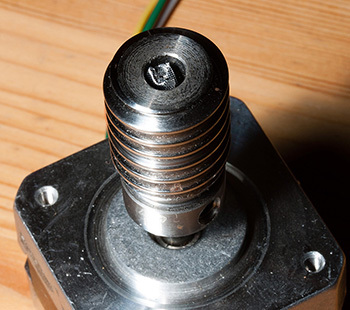 The rotation gears and spring are not very strong, and trying to mount it on a moving or vibrating object can cause it to rotate too quickly or not at all. It also tends to wobble and the GoPro probably approaches the weight limit for the device. So I wanted to come up with something else. Something that I could quickly set speed and direction, that would be strong enough to withstand movement/vibrations, and would be able to handle larger cameras. I typically want to pan at slower speeds, and wanted to be able to get a range of kinda slow to extremly slow in one unit. I started looking into the arduino and the commonly available motor shield that allows it to control servos, DC motors and stepper motors. There are also displays that can be plugged into the arduino to allow for easy programming without having it tethered to a computer. For the drive system I needed something that would turn very slowly. As I was searching, I found servocity.com. They sell a worm drive gearbox which takes an input and slows it down by a factor of thirty. I figured this would be perfect to get really slow pans. The only problem was the it was designed to work with the line of DC gear motors that they carry. I'm sure that works well, but I wanted to be able to control the speed to a greater extent without having to switch out motors. I figured that stepper motors would be best for my needs, since with a little bit of programming they can be made to be infinitely slow. Looking at stepper motors, I found that they can be rather expensive. I purchased several scanners at thrift stores and pulled the motors out of those, but didn't find anything suitable. Eventually I found a 200 step, 12 volt stepper in a NEMA 17 package from AdaFruit. The NEMA-17 has hole spacing that is the same as the gear motors from ServoCity, and I was pretty confident that I could modify the worm drive gearbox to accept it. Also I would have preferred a 400 step motor, but with the worm drive gearbox reduction the 200 step takes 6000 steps to rotate through 360 degrees. This works out to .06 degrees per step, which isn't bad. It works very well, although I'd still like to source a 400 step 12v motor in the same configuration. Here's a video that I took with it while testing. In this video it rotates a GoPro through 95 degrees in ~40 minutes. Pictures and explination are below the video. 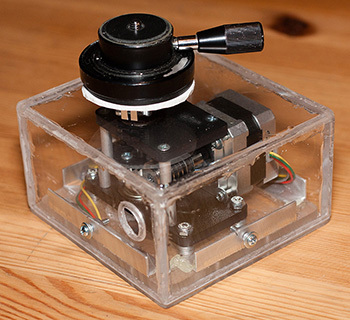 This is the worm drive gearbox with the NEMA-17 stepper motor mounted. It's very well made. Ideally I would prefer the top and bottom plate to be made of aluminum, (instead of ABS) but it is very sturdy. I've mounted it to my motorcycle and have no worries about it despite the wind and vibrations. 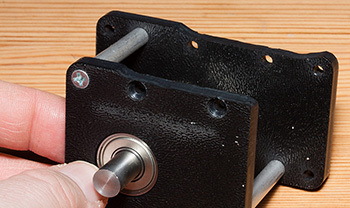 To mount the stepper motor, I needed to grind away some of the top and bottom ABS plates. 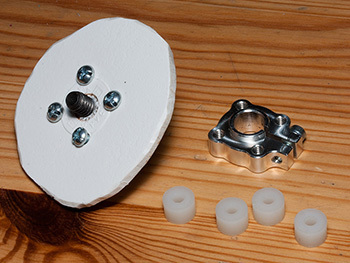 The stepper motor overhangs these where a DC gearmotor would not. 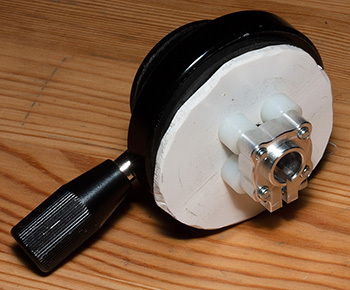 Easy to do with a Dremel tool. I also needed to remove some of the metal around the large shaft hole, as the stepper motor has a raised lip that surrounds the shaft. 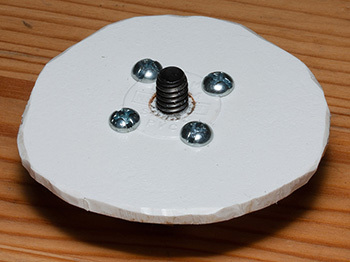 (see below picture) I used a milling bit in a drill press to take care of that, although I could have used the Dremel tool again. 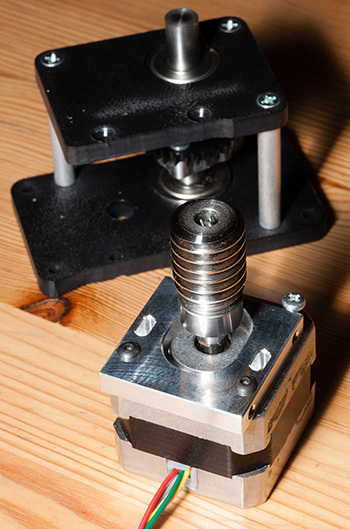 One of the things that I needed to take care of was the smaller motor shaft in the NEMA-17 stepper. The worm gear is designed to work with the DC gearmotors that servocity sells, which have a shaft diameter of 6mm. 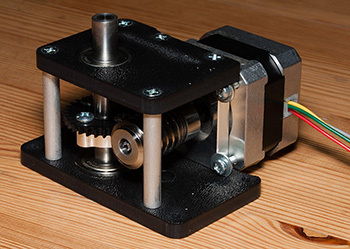 The NEMA-17 stepper motor has a shaft of 5mm. While I could have easily tightened the set screw on the worm gear to take up the difference, it would cause the worm gear to rotate off-center. An off center worm gear translates into alternately more and less play in the final rotation shaft. So to take care of this I used a few thin sheets of metal (aluminum cans work well) wrapped around the motor shaft to build up the diameter. 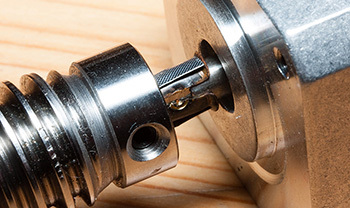 The closer you can get to 6mm, the better you'll be. You can see the metal sheets that I used protruding from the bottom of the gear. And here's the top of the gear where you can see the thinsheets folded over the top. So here's the stepper motor mounted to the motor plate. you can see that the motor hangs over the edge of the plate, which is why I needed to grind away some of the ABS plates. So now I needed a way to mount a camera or tripod head to the final drive shaft. 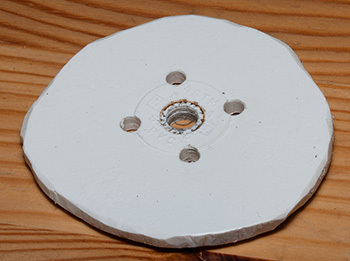 I started with a plastic sheet, drilled holes in the necessary pattern, and cut it into a very rough circle. Then I put a short 1/4-20 bolt up through the top center hole, and screws to mount to the 3/8" clamping hub. 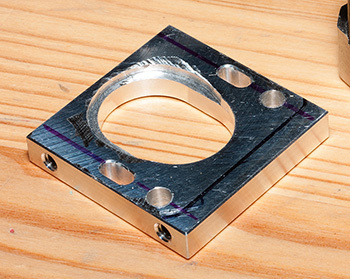 Here is the clamping hub with a set of spacers. And here's a bottom view of the assembly tightened down to a rotational head. The rotational head allows me to adjust the position of the camera before starting the movement, and to get an idea of how far I need to rotate it. And here's a view from above. Eventually I'll get a small ballhead to replace the rotational head. When I do I'll clean up the rough build quality. And here it is all together. I'm building the box to protect it and give a more finished look. It also provides a very solid base to mount it to a tripod.